Sixty-nine percent of respondents reported seeing an increase in patient compliance as a result of a population health management program, according to a recent Healthcare Intelligence Network survey. Although managing patient populations can be challenging, organizations with these programs have seen many other positive impacts on population metrics. Kaiser Permanente is able to manage the health of its population proactively by maximizing patient touchpoints, modifying workflows and creating a safety net for high-risk conditions. This HINfographic on managing population health illustrates PHM program impacts, information typically included in patient registries, specific tools being used to strengthen care performance and more. 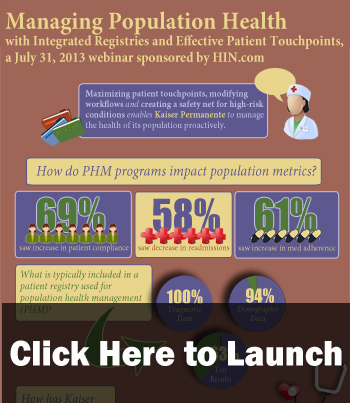 Jim Bellows, PhD, Senior Director, Evaluation and Analytics, Kaiser Permanente, will share Kaiser’s approach to population care and PHM during Managing Population Health with Integrated Registries and Effective Patient Touchpoints, a July 31st webinar. You may also be interested in this related resource: Guide to Population Health Management. This entry was posted on Monday, July 15th, 2013 at 1:30 pm	and is filed under Avoidable ER Use, Hospital Readmissions, Infographics, Patient Engagement, Patient Satisfaction, Population Health Management, Quality Improvement, Reducing Readmissions. You can follow any responses to this entry through the RSS 2.0 feed. Both comments and pings are currently closed.